Turning the kitchen into a small laboratory is a challenge for design lovers. Dedicating necessary time to the kitchen design is the best way to make the space fully functional. By doing so, you will be able to turn the place into a corner of the home where you will feel comfortable, and won't think twice before putting on the apron. One of the options that interior designing offers us is to decorate the kitchen as per our taste. Away from the tightness to which these areas are sometimes subjected due to static modular compositions, the custom built-in kitchens offer endless design possibilities. Among them, you can find the combination of materials, peculiar furniture or coatings the walls and floors. 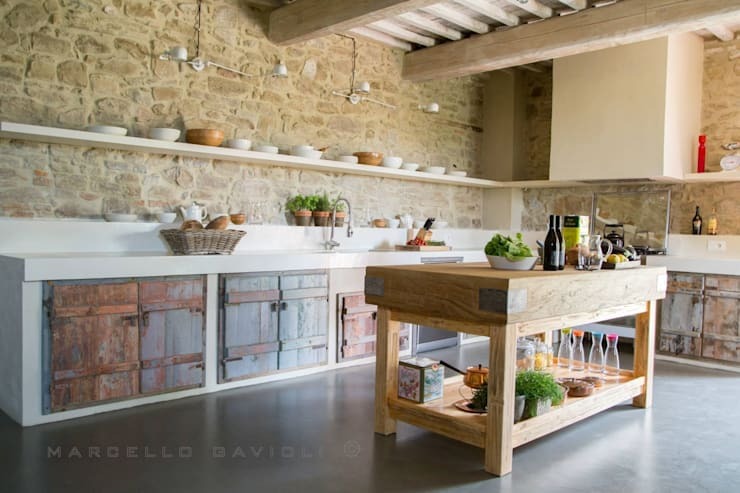 In this ideabook, we propose a tour of ten custom rustic built-in kitchens that will make you fall in love with the design. 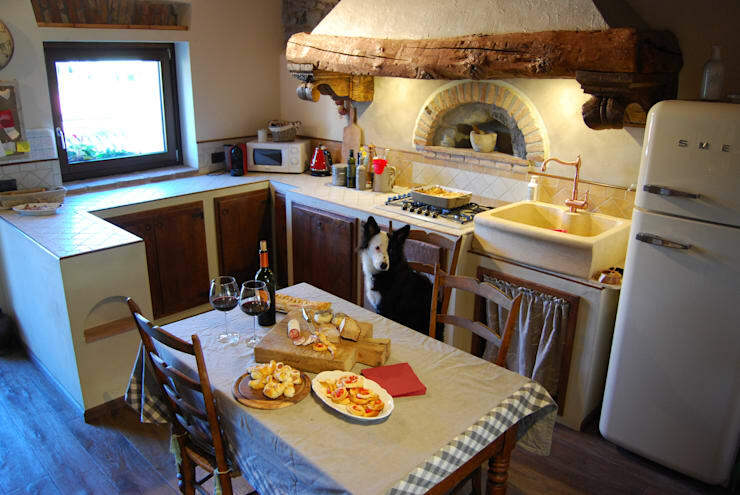 The kitchens of work are a classic, especially inside rustic-style houses. Its design is a canvas that reflects a modern as well as an industrial air. 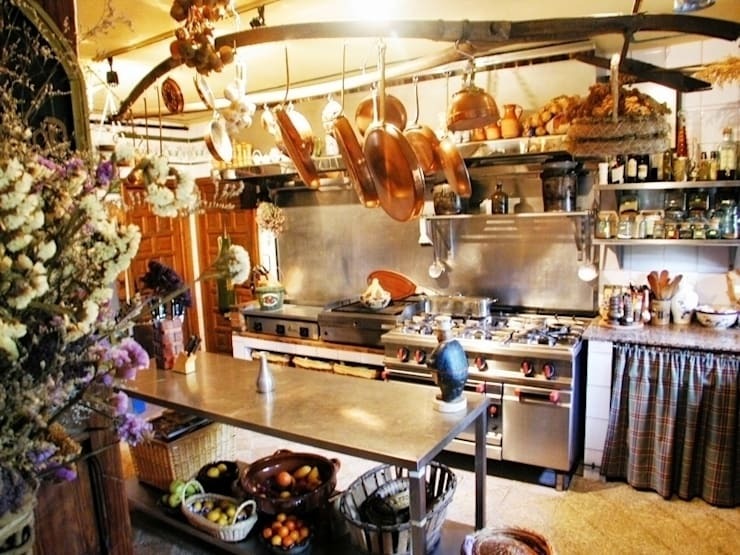 In this case, the modernity is strained within the kitchen which fills it with a sophisticated atmosphere. It is achieved by the character that prints the room and the wood used for its furniture. Respecting the charm of traditional homes has become a favorite trend within the decoration and interior designing industry. Ibiza is the kingdom on which stands this particular castle. It is a house that has undergone a significant reform but still retains the essence of its Mediterranean style. 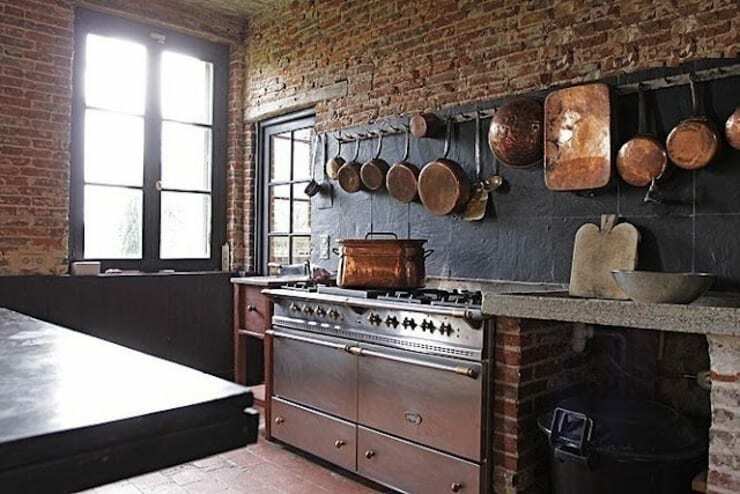 This kitchen, delimited by a small wall inside a larger room, represents the characteristic elements of the original house. It is a kitchen of work that does not lack any detail. A simple worktop on which a traditional gas stove and a sink sit are the essential elements of this kitchen of works. Its simplicity is the basis of this particular design. The tiled walls that take us back to the past act as the protagonist. 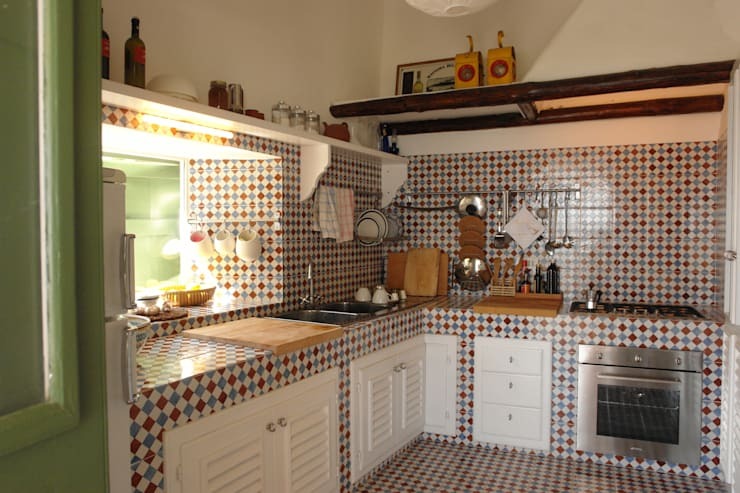 Also, the highlight includes hand-painted pieces of tiles incorporated in this kitchen. We give you this proposal that is away from all traditional kitchens. It perfectly combines tradition with modern built-in kitchens. The brick walls help delimit the kitchen marking each area individually. They also bring a touch of old style to this modern design. Here we can see its contrast with the contemporary technology which forms the functional part of this kitchen. It also complements other elements such as the slate used in the room and the stack of stone or copper utensils for cooking. 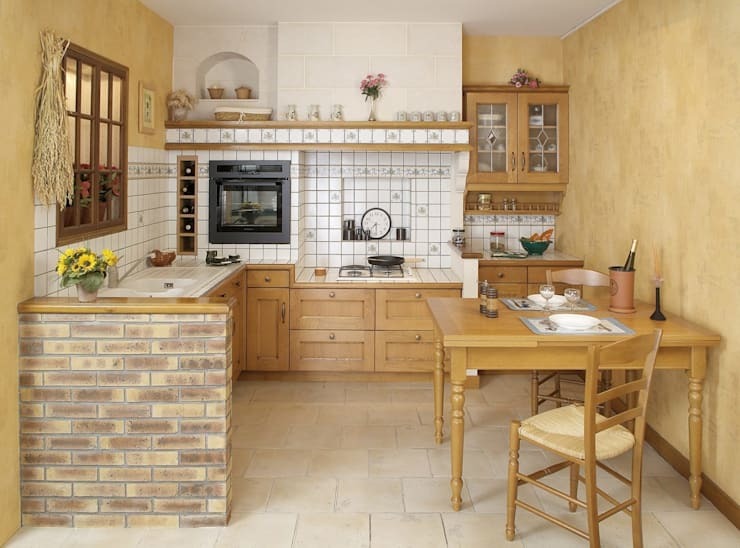 Wood and bricks are two materials preferred in the kitchen. 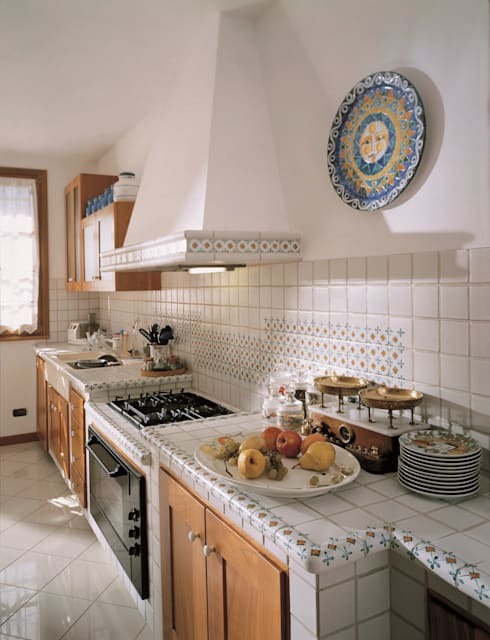 Their combination with tiled walls and countertops are common in such kitchens. The Extremadura Firm which is a specialist in manufacturing furniture is responsible for this design. They have turned it into the perfect example of a material symphony which also results in an ideal workmanship. The wood gives life to the furniture that shares its charm with the tiles used for counters and walls. This built-in kitchen is located in a completely renovated wheat mill which has been turned into a home. Here modernity and traditions go hand in hand. The passage of time has not made a dent in this stay which dates back to 1770. 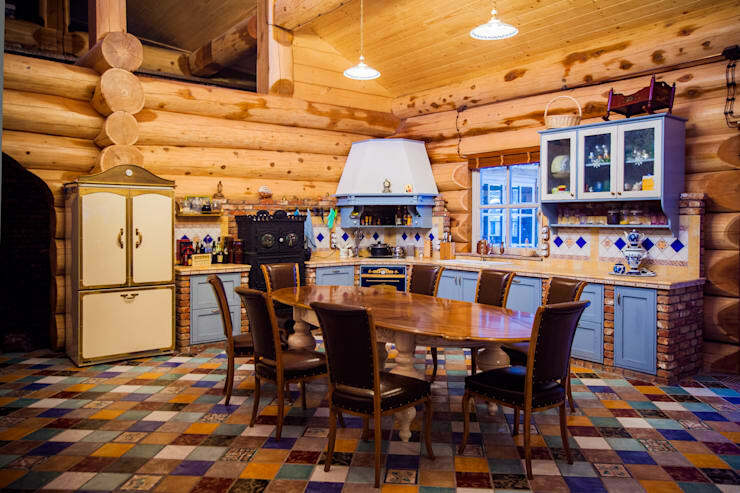 Despite undergoing a complete renovation, it still maintains the charm of traditional kitchens. The thing that has left a mark in this particular room is the way it was used over the years. After the reform, it also served as a restaurant kitchen for some time. As if from the very court of King Arthur, a large oval table presides in this kitchen which also makes a difference. The wood that covers the wall is protected in the most sensitive areas by a coat of tiles. Its contrast with the color of the floor tile creates a fun and unique atmosphere. By using auxiliary furniture of vintage style, the designer was able to create a beautiful space. 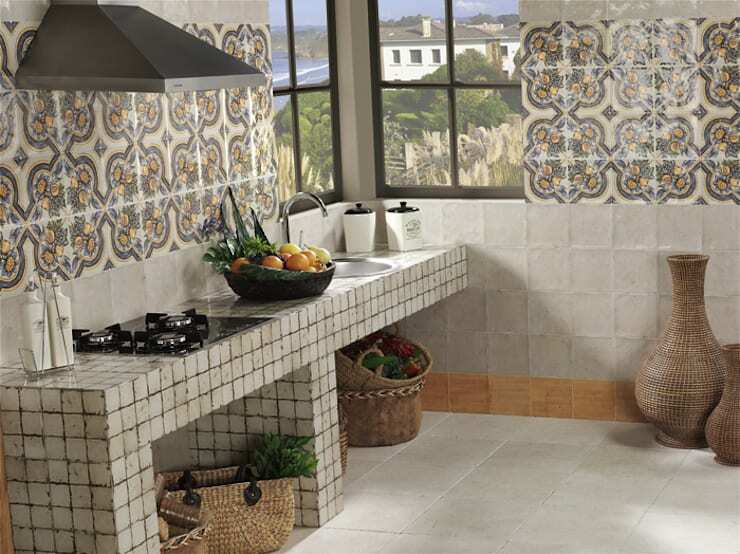 Tile is another material which is preferred for kitchens of work. The use of this stuff for coating the kitchen and sink area is widespread. Also, they are sometimes incorporated into the furniture or worktops. The design of this kitchen takes advantage of the wall tile details. It has been practically converted into a border, to delimit the edge of the tile-coated countertop. A gas range, built-in wall mounted hood, and wood trim completes the picture of this classic kitchen. A kitchen is not just about culinary talents. These rooms are authentic canvases where you can let creativity fly either before the stoves or in the design of the space. By using the same coating for walls, floor, and furniture, this kitchen becomes a fun and joyful place. It also invites you to enjoy the overall ambiance. The white details of the furniture and the upper half of the walls add serenity to an energy-charged kitchen. The combinations for creating an ideal kitchen are so large that only you can decide which elements you would want to integrate. However, before you start designing you must be clear about what you want it to look like. It is a place that gains fans over time. If you are not clear about your starting point, then you can check out some other designs as well.